Please welcome Marigold of Hideous! Dreadful! Stinky!. Marigold not only has an amazingly creative mind, she also has a great sense of humor. I had so much fun getting to know her better over fondue at Alt. Today she's going to share a super cute tutorial with us. Be sure to visit Marigold's site and follow her on Pinterest, facebook, and instagram. Hello, small + friendly readers! I'm so happy to be here today filling in while Carla snuggles with her new little baby guy. I'm Marigold, and I have a blog on the other side of the Internet called Hideous! Dreadful! Stinky! where I share lots of tutorials and inspiration for artsy/craftsy folks like yourself. 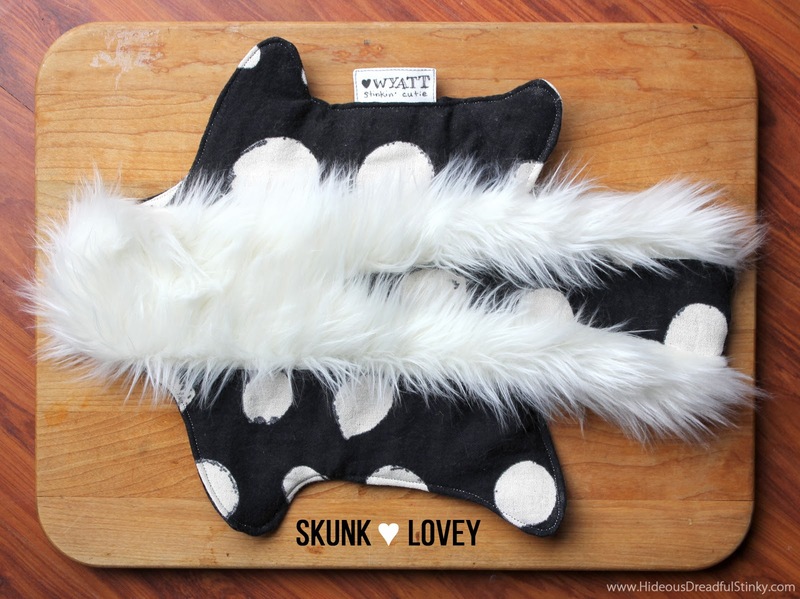 ...a Skunk Lovey, of course! 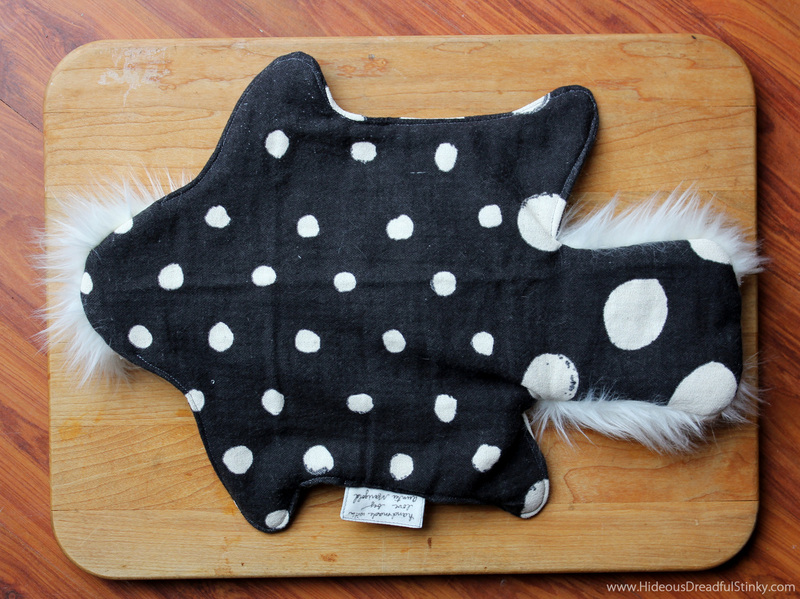 For this project, I used a gorgeous Nani Iro double gauze "Woodblock Pocho" from the summer 2013 collection that has been sitting in my stash for awhile, and a fun faux fur in white. Unfortunately, the Nani Iro double gauze is kind of tough to get a hold of in this color anymore, but any soft black fabric will do! First, I cut the body from 2 pieces of the double gauze and a piece of organic cotton quilting batting. Then, I cut a strip of faux fur that went from head to tail. 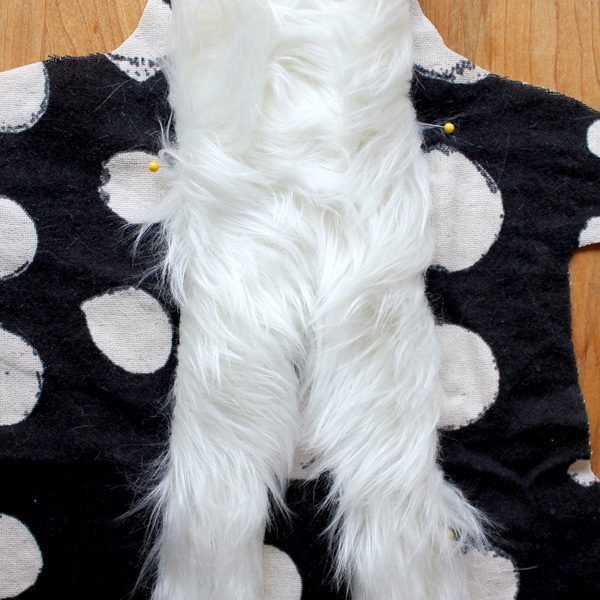 I split the fur down the center about 2/3 of the way up from the bottom. The faux fur doesn't need to be hemmed, but since I cut through the furry fibers, I did need to go along the cut edges and remove as much of the loose fur as possible. It was pretty messy, but having a lint brush handy helped a lot. 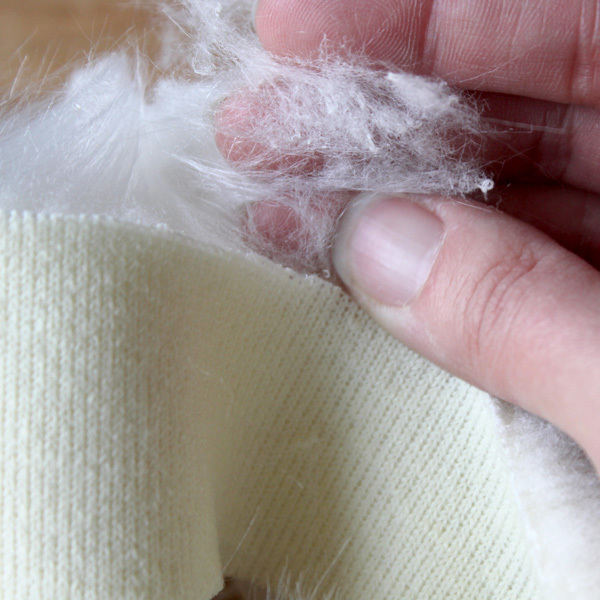 Once I removed all of the loose fur, I pinned the strip into place, with the split going over the tail end. 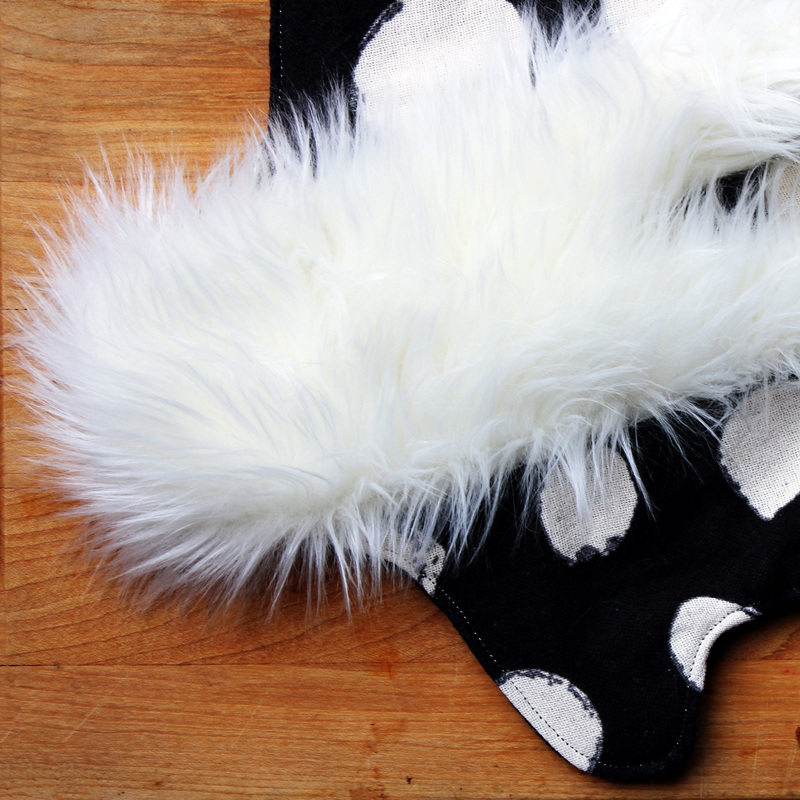 I finger-brushed the fur toward the center of the body as much as possible, too. Then I used white thread and sewed the strip into place. I also wanted to make a personalized tag for the lovey. 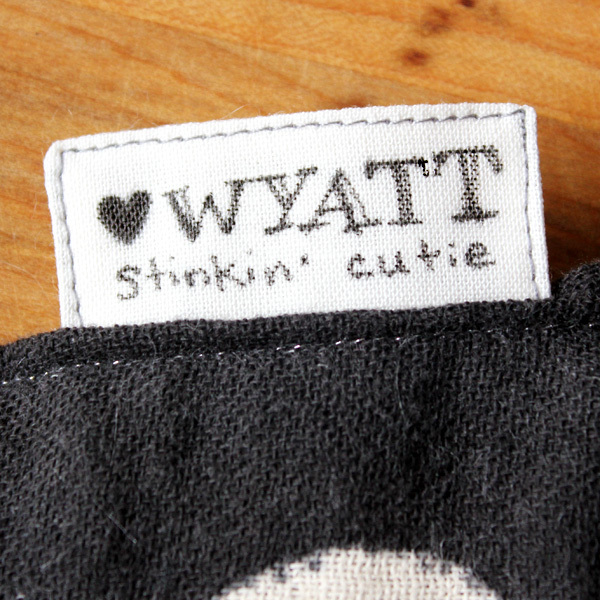 I made it from a piece of plain white cotton fabric and wrote "♥WYATT stinkin' cutie" on one side and "handmade with love by Auntie Marigold" on the other side. With the fur strip was in place, I placed the second piece of double gauze (the skunks's belly) right-side facing on top of the first body piece, once again making sure all the fur was combed in towards the center of the body, and the hair at the head is "combed back" to prevent it from catching into the seams. Then, I placed the quilt batting on top of that, and then pinned everything in place all around the edges. Starting from the side, I sewed all the way around the body, leaving a 2"-3" opening. I then snipped around the curves and pulled the whole thing through the opening, right-sides out. I tucked my homemade tag into the opening, and then edgestitched along the sides of the skunk to close the hole and to give it a little extra stability. And that's it! I hope you'll come by and visit Hideous! Dreadful! Stinky! for more crafty fun and inspiration. You can start with some reader favorites like my Crayon Teeth Monster Art Totes and my Reversible Cape Tutorial. I hope to see you over there!